It is difficult to think of a more dramatic name for an opera, in any language, than Richard Wagner’s Götterdämmerung. Twilight of the Gods, to give it its English title, certainly lives up to expectations. Siegfried, having rescued Brünnhilde from Wotan’s prison of fire, entrusts the Ring of the Nibelung to her as a sign of his love. Siegfried, with Brünnhilde’s blessing, goes out into the world to commit acts of valour while Wotan has already determined that the days of Valhalla are numbered. Hagen is hatching a plan that will see his half-brother Gunther married to Brünnhilde and his half-sister Gutrune take Siegfried for her husband. There is, however, a nefarious purpose to his actions. He is the son of the dwarf Alberich whose theft of the Rhinegold set in train the events that threaten to destroy both the gods and humanity. 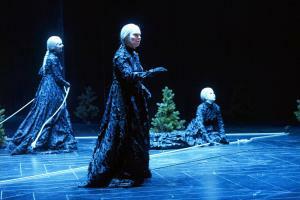 Gutrune gives Siegfried a potion that makes him lose all memory of Brünnhilde; Siegfried then dons the Tarnhelm, the magic helmet fashioned by his foster father, Mime, to take on the appearance of Gunther and wrest the ring from Brünnhilde. Distraught, Brünnhilde reveals Siegfried’s only weakness to Hagen, giving him the means to kill Siegfried and obtain the ring. While Gunther also now covets the power the ring holds, it is Brünnhilde, as she prepares for Siegfried’s funeral, who must decide how to remove the ring’s curse and free the Earth of the gods. Götterdämmerung is the final work in the cycle of operas that comprise Wagner’s Der Ring des Nibelungen (‘The Ring of the Nibelung’). Premiered on 17 August 1876 at the Bayreuth Festival, Götterdämmerung was the culmination of the first performance of The Ring in its entirety. Now in performance at the Wiener Staatsoper, Götterdämmerung is Wagner at his best: a captivating experience that absorbs the senses and, in contrast to the outcome of its story, retains something of the divine in its music.